I benched one of my hockey players for the first time a few weeks ago. I've come close to slapping people on the pine before, but this was the first time I actually pulled the trigger. This season, I'm serving as head coach for a squad of 9 and 10 year old house league lads in Toronto. They're a great group of kids and so far, we've been able to rack up a perfect record. In house league, you see, my idea of an ideal record is .500 and we're sitting at 6 and 6 – a perfect way to teach the players how to win, and how to lose. With that said, not everything is perfect. 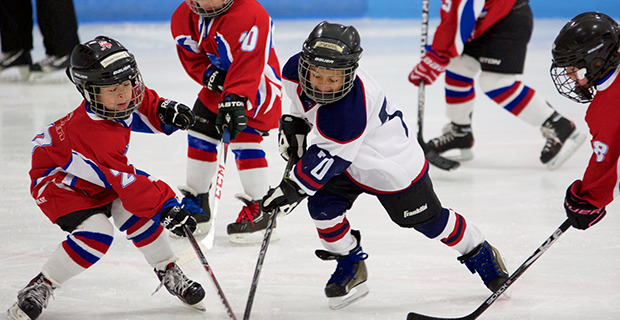 On every team, you inevitably have a few kids who complain about ice time. At the house league level, you always try to distribute shifts as evenly as possible. "Bobby! Change 'em up! Bobby! Let's go"
Unfortunately, however, little Bobby doesn't always hear the coaches screaming for a line change, or he pretends he doesn't hear. That can lead to a few guys getting short-shifted, resulting in some short tempers from the small fries on the bench. That was the case a few weeks ago, when one of our players in particular kept complaining about his minutes. "I hardly got out there," the young guy complained, slamming himself down in a frustrated heap. Now, if this was the first time for the grumbling, the coaches would've given him a pass. But it was the tip of the iceberg after a few weeks of whining and it was time for something to be done. Benching a player, however, isn't a decision you take lightly. It might be an easier practice to adopt in "rep" hockey, where it's understood that a high level of performance and behavior is expected if you want to keep your spot on the team. But in house league hockey, the stakes aren't as high and everybody understands that "fun" is the number one goal. It's obviously not too much fun to ride the pine. But if a problem with a player persists, and your message just isn't getting through, it's time for the coach to put his foot down. 1.) Don't yell and scream or lose your cool. Simply explain your reasoning to the player and identify the behavior you'd like to see change. "Okay, Enough complaining about ice time. We've talked about this before and it doesn't seem to be sinking in. We're trying our best to give everybody equal ice time, but it's not always easy. You're attitude isn't helping, so you're going to miss a shift. That will give you some time to think about some of the things we've discussed." 2.) Talk to the player and his parents after the game to explain the reason for the benching. If mom and dad were paying attention, they probably noticed the missed the shift and will want to know the reason for it - an injury, equipment malfunction... or poor behavior. Again, discuss the benching in calm, measured tones and encourage the family to talk about the situation on the car ride home. In most cases, if the benching was justified, the coach will find he's got pretty good allies in the player's parents. 3.) Don't treat the player differently after the benching. Kids (and coaches) are learning on the fly. They're going to make mistakes on the ice and on the bench. Keep an open mind after handing out discipline and give the player a chance to show that his attitude has undergone a positive change. In our particular case, that's definitely been the situation, as we haven't heard a peep about ice time issues since the recent benching. At the National Hockey League level, where players make piles of cash, it's sometimes hard for a coach to find the proper method to motivate his team. But any coach will tell you that, even in the NHL, players love their ice time. Take a little bit of it away and do it in the right way, and you'll be surprised at how polite your players will suddenly become.